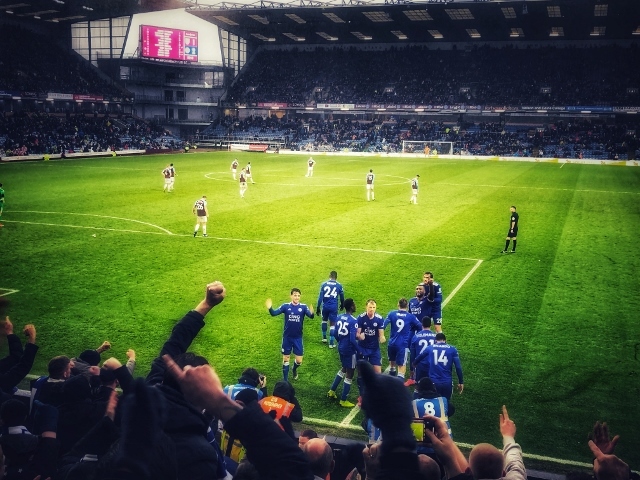 A 90th minute header from Wes Morgan gave Leicester City a first away victory under the management of Brendan Rodgers and plunged hosts Burnley deeper into trouble in their battle to avoid relegation from the Premier League. 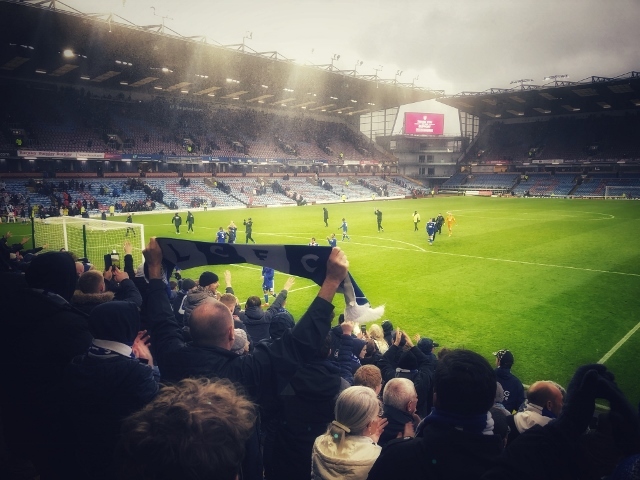 Despite playing most of the game a man short, following the early dismissal of Harry Maguire, the Foxes showed remarkable character and resilience to overcome both their opponents and the elements during a match played in incessant heavy rain. 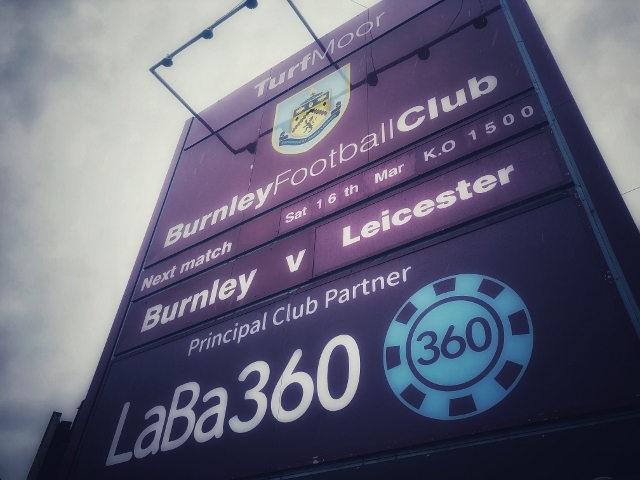 When visiting supporters arrived at Turf Moor several hours before kickoff, they were perturbed to discover that parts of the adjoining cricket ground were already under water. 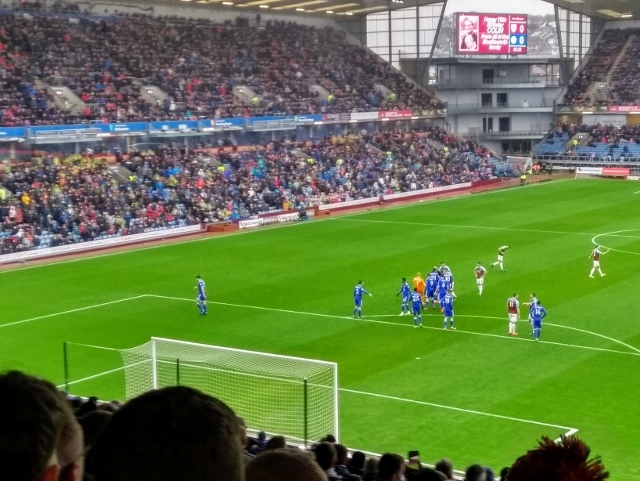 Fortunately, the efforts of the Burnley groundstaff ensured that playing surface was not unduly affected and there was no risk of the game being postponed or abandoned. Rodgers had signalled his satisfaction with the previous week's performance by naming an unchanged squad. However, as so often on recent City away trips, an early setback forced a rethink in plans. A sudden break by the home side in the 4th minute caught the City defence flatfooted and saw Gudmundsson go clear on goal, only for Maguire to clip his heels. Referee Oliver clearly deemed intent in the challenge and produced an immediate red card for the England star. Gudmundsson's subsequent free-kick was tipped over by Kasper Schmeichel to limit the Foxes' pain. Morgan was immediately brought on to replace the unfortunate Demarai Gray, and the City defence adapted very quickly to the enforced change, allowing the side to continue taking the game to their hosts. In the 33rd minute, the visitors' enterprise brought its reward, when clever footwork from James Maddison enabled him to earn, and then convert, a 20 yard free-kick. The midfielder's celebration featured a tribute to a young fan at his previous club who had recently succumbed to cancer. Although the message was clearly heartfelt, Rodgers and others may wonder whether it was worth collecting the yellow card that was inevitable once Maddison removed his shirt to reveal it. But The Foxes’ lead proved to be shortlived, as an error by Jonny Evans was seized upon by former Fox Wood, who began a swift counter-attack which finished in McNeil firing an angled drive beyond the clutches of Schmeichel. City thus continued a dismal record of only keeping one clean sheet since 1 December. This is an area which the incoming manager needs to address with some priority. Following the break, the home side looked to make more of their numerical advantage, but excellent defensive work by Morgan and Evans prevented any serious threats to the City goal. 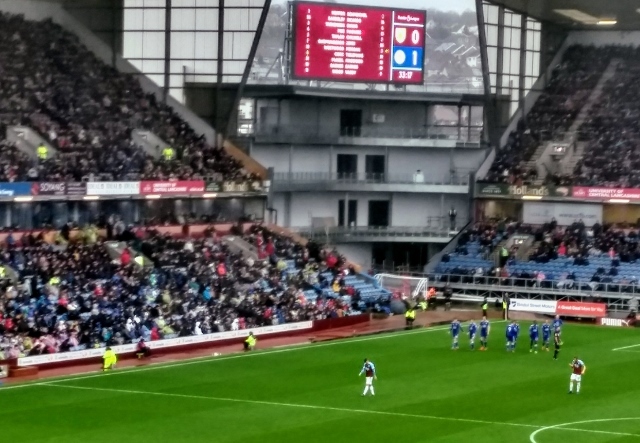 Burnley's biggest threat came through two penalty claims – first when Taylor hit the ground following a challenge by Wilfred Ndidi and then, with slightly more optimism, after Morgan had blocked a Crouch header from point-blank range. As the wind and rain intensified during the closing minutes, the game looked to be meandering quietly to a draw. City, though, had other ideas. 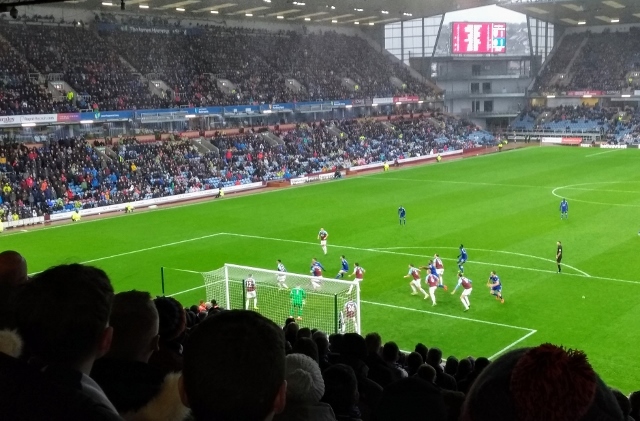 Strong pressing forced the Clarets to concede a corner, and when it was not properly cleared, Youri Tielemans' cross looped off Taylor into the path of Morgan, who nodded home to spark manic celebrations among the 2500 travelling Foxes. The home side responded by stepping up the pace, and only a strong reaction by Schmeichel prevented Vydra from netting an instant leveller. But the Foxes were able to see out stoppage time with their lead intact. 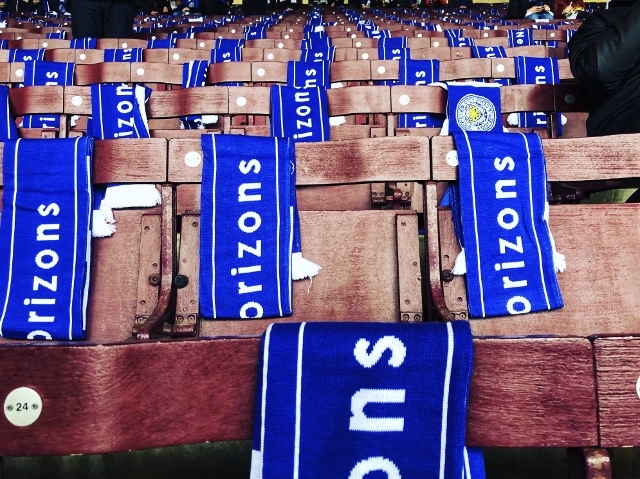 While this result was perhaps not a true reflection of the overall balance of play, few Foxes are likely to unduly care, especially after having been on the receiving end of several stoppage-time goals during our travels this year to date. Hopes of a Europa League place next season have now been rekindled, though much will depend on the outcome of this season's FA Cup and an ongoing investigation into Manchester City's breach of UEFA Financial Fair Play rules. For now, though, Rodgers and City will take one game at a time and look to build on the momentum generated by successive victories to finish the season strongly and lay the foundations for greater success next time around. City (4-2-3-1): Schmeichel; Ricardo, Evans, Maguire, Chilwell; Ndidi, Tielemans; Gray (Morgan 6), Maddison (Fuchs 64), Barnes (Mendy 77); Vardy. Subs not used: Ward, Ghezzal, Okazaki, Iheanacho.